For your pleasure . . . .
Update [2006-1-31 18:15:26 by Super G]: NY Times reporting: "Bush to Say 'America Is Addicted to Oil' in Speech". President Bush plans to tell Americans tonight that they must not retreat from challenges at home and abroad, that they make the economy of the United States the best in the world, but that they must break a national "addiction" to oil. "In a complex and challenging time, the road of isolationism and protectionism may seem broad and invited, yet it ends in danger and decline," Mr. Bush says in his State of the Union address, according to excerpts issued in advance by the White House. Once Iran is referred to the security concil on Thursday, who thinks they will cut exports? What do you think the chances are they send a gurilla unit to take out a supertanker? How expensive do you see gas prices on Friday? Iran has no incentive at this point to provoke us any further. If they stop shipments of oil, they will then be in violation of U.S. Executive law(Carter Doctrine). As it stands Iran is technically in the right, and they won't do anything more to provoke the West. They will force us to make the first move(or call our bluff).. Here is a question for the Geo-politically minded people out there. To give USA enough rope to hang itself? Not that they need a lot, heh? The Security Council still needs to wait for the IAEA report to be issued in March before considering actions against Iran. When that time comes, there may not be any agreement amongst council members about what action, if any, to take. Russia and/or China could simply veto sanctions if they want. We can't forget that Russia has been having far worse problem with Islamic fundamentalists than we have. They have had continuous terror attacks and have responded in kind. They are much closer to Iran and have more to lose and gain than we do. They don't want to have Iran as an enemy, but I'm sure they don't want Iran to get a dirty (or "clean") bomb to deliver to radicals in Chechnya either. With the unstable politics in Iran, it's a touchy game. I don't think China and Russia have caved yet. They have not committed to aproving anything in regard to Iran. I'd be very surprised if they did. To begin to understand the current landscape you have to first understand we have all been conditioned to view the world in a bipolar way. There is a "good" and a "bad" and to us the US represented the good. The world is shifting to a unipolar landscape. There is no more "bad" and "good". All the major economic nations are working together to close the gap, containing all the energy and natural resources, and unite the globe. The US is basically a global police force, called by Barnett, the leviathan (why do you think we spend more on the military than the entire world combined?). As the strategy evolves they are beginning to form a Sysadmin force that will stabilize counties after the leviathan has toppled the noncompliant government. "Security that American military strength provides is as important as any of those other flows. If you remove that security, you will feed the disruption of the flow of people, investment, and energy. Walls will go up and globalization can be killed. That is one thing that the American public does not understand. Our export of security is one thing -- it does not mean exporting arms. It means paying attention to mass violence around the world. The Department of Defense is the world's largest consulting force. It goes to where the "client," so to speak, lives. The American public only wants to hear about the exit strategy. But "the boys" are not coming home until we make globalization truly global. People don't want to hear about that long-term effort. People might say a "happy ending" is naive, but there is enough in the book for me to show that I am not "a wooly-headed peacenik." I come from the world of national security -- I work at the Naval War College -- I can say that there is a happy ending if you have the courage to recognize the path that lies before us and the tremendous opportunity that lies beyond. The society is on the verge of eliminating war as we know it. That is what the book seeks to describe." The Carter Doctrine, I understand it, does not apply in this case because Iran (i.e. Persia) is a Persian Gulf county. The key sentence of the doctrine states that the US will prevent any outside force from gaining control of the region. Your point however is not weakened, rather it is strengthened because of the more recent G. W. Bush doctrine. It is indeed striking that Russia and China are going along with this. But that might be a result of America's conduct of the Iraq War and subsequent occupation. Their worst fears were not realized - an exclusive takeover of the oil fields. Russia benefits greatly from high petroleum prices. China puzzles me, but economic ties with the US may play a part. This theater they are playing is for the public only. None of the sides is so stupid to do anything, it is a zungzwang situation. Whichever way they go, cutting exports... or even backing off a bit, the public will have an opportunity to see how close we are to significant energy challanges. A few weeks of bouncing around $80/barrel might be scary, but useful. How will our major media connect the dots? Will we get a legitimate story or will we be treated to news clips of Iranian mullahs? I don't expect to see vids of lumbering SUV's cruising for E80. Light crude prices seem to be having a difficult time holding above $68/bbl, but like a moth to flame can't stay away from that level. The too easy story to my mind, is that this price premium is driven only by geopolitical anxieties focused on Iran and Nigeria. The price to problem corelation is not strong enough, to my mind. (I imagine that traders are catching on to the underlying geological supply problems and reading Staniford et al. late at night on TOD.) Anyway, the real surprise is that prices have held up to the extent they have. Why? Incidentally, gas prices in Eastern Maine are drifting down and have no relation to crude prices, just yet. I really don't understand why Iran should cut their exports. It would send crude prices higher (a lot) but who will take the profits : Saudi arabia, irak (a little), and all the nasty neighbours not specially nicely inclined to Iran. Then when oil flows back, the prices would drop significantly with a psychological mechanism bringing them under the present level which would mean still less profit for Iran. If they made special agreements whith other countries like China, it would lower competition and thus the prices. 2.) US interest rates climb to 30% to finance purchases of sky-high SUV food supplies while American Airlines, Delta and Southwest... stop flying then go broke 6 months later. 3.) or what?.. France nukes Israel (or US) in response to <whoever's> use of tacticle nukes in Iran? 4.) OK! I don't know what, but one thing is a sure bet; Something ugly is going to move very far to the right on the probability curve. Welcome to the "Real War on <Oil> Terrorism". Osama is just a neighbourhood gang player in this one. Iran got everybody by the short hairs with this nightmare "End of diplomacy" play. To me it looks like Iran gets nuclear power... hands down, or you/we get 1 and/or 2 maybe 3 and certainly 4. Hey, what the hell, maybe the State of the Union Address "When America leads, America wins" will cheer everybody up. Well, well, I don't believe it would be such bad. Nobody really want things to go that bad, even the Iranians (who in a vast majority are very well educated, and belong to a culture with the most ancient history). Iranians can't afford not to sell their oil. If they take their production out for a while, it wouldn't be long. They might sell it to China, but that would diminish the pressure for overall competition. Bush impeached ? Which purpose would that serve ? France nuking Israel or USA ? I've heard that before. But Chirac's speech really mean't : Dear George, I'm back with you. Don't forget his minister, Mr Sarkozy, went to school with the neocons. If oil price rallies over a short period, dollar will fall back, and USA will export again like ever. Who would take profit ? My point was that profit is not <always> the motive for driving the bus. Another article at EnergyBulletin about trading oil in Euros (and the Iranian Oil Bourse). Gas at $3.15? Most unlikely. I give that probability a 1.000 My price is 1.00 Euro/liter = $4.60/USGal. Hey that's just to let you know it IS possible... and if IT is possible, my experience tells me its only a matter of time before IT happens. Gasoline is not going to be $3.15/gallon on Friday in the United States. Period. Stop the Iraq War first before you worry about stopping the next one. Doing the first might result in the second never happening. They won't take out any tankers, but they surely might not send any out either. Buy futures before then! Ya the risk is priced in now, but its only the probability, NOT the certainty. I'm interested in folks thoughts on which uses of oil/NG products are more important to the economy than others. That is, which are price sensitive and which aren't. Please includes thoughts on substitutability with other methods/end products and how scaleable they are. Hawaii, Guam & Puerto Rico are dependent upon bunker oils (low grade stuff) for electricity and will be until alternative fuel (likely coal, but possibly LNG) plants are built for all of the demand. Since we hit Peak Oil for light sweet in 2000/2001, the supply & cost of bunker fuels has been better than for higher end product. The yield of bunker fuels from heavy oil is higher than for light crude oils. Other uses for oil products for electricity and industrial heat can be rapidly substituted. Limited subsitution for home heating can be made with natural gas and quite limited substitution with wood. However, this winter has shown a good price elasticity of demand for heating and natural gas in general. In late December, we were actually STORING NG for one week. An interesting crunch will come in demand for NG to extract tar from Canadian tar sands. 2,000 cu ft/2 million BTUs of NG per barrel of tar with current technology. Do I have this right? 2 million BTU's of NG to produce about 40 gallons of bitumen tar? My calculator says that 40 gallons of diesel contains about 5 million BTU's. Is the barrel of tar equivalent to heavy sour crude in terms of refining costs? Looks like an EROEI of about 2.5 before refining. Not very good. Even worse considering the value of NG. Can superheated water from a nuclear plant hydrogenate the tar? It is an interesting question. Use the NG in Qatar to directly make gasoline there and ship the finished product in or ship LNG to US, substitute that for Canadian NG, use Canadian NG (15% of US imports) to extract tar from sand and ship said tar to special refineries to make diesel, bunker fuels, asphalt (bitumen) and a bit of gasoline ? Better to build nuke (or wind) in Texas, California etc where high % of electricity comes from NG, substitute uranium or wind for NG, ship NG to Chicago to substitute for Canadian NG for tar sand use. Strip mining is a mobile process, moving from site to site. Nuke reactors (except USN) are not mobile. Major issue to feed nuke plant site with enough tar sands for 40+ year life of reactor. You dont need to move the nuclear reactor just pipes to transfer the heat to the place of tar sands production. My guess is that you can build miles of pipes without significant losses. For 50 miles of flat terrain pipeline with 100,000 BBLS water (cold)/day I'll semiWAG it @ 5,000,000 BTU for pump power. Add another say 1 million BTUs for each Degree F you need to heat the water plus 50 million for nominal estimated cooling losses along the pipeline. So maybe 250,000,000 BTUs if they need 150F water 50 miles away, assuming you can recirculate the water and it comes back at 70F. Don't know how they use the water at the fields. I would hope they don't discharge it there at the tar field. Yes you certainly could use nuclear generated electric instead of the gas to process the sands. And this has been considered. The catch is that nuclear power is difficult and expensive (nuclear power has a long and very spotty history financially) and it not clear there is an energy gain when all is said and done. Plastics/fertilizer/cement in the U.S. are heavily dependent on natural gas availability. The first and only reaction to high prices is usually to offshore the production, though. How important is kerosene in the U.S. or is that under jet fuel? Forgotten so far is oil based paint. According the Sherman Williams, for every 10% rise in the cost of oil there is a corresponding 1% rise in the cost of paint. What is needed here is a breakdown by category or product in terms of its percentage "take" of oil produced. For example, gasoline consumes approximately 45% of oil produced. Once the list is completed, then we can see what can be done in terms of each category. Um, so Exxon Mobile posted the highest annual profit ever recorded for a corporation, up 42% from the previous year's profit. What would YOU do with $36 billion in profit? That's a great question. That really should be invested in renewables, but I doubt it. They seem to be using the money to tick off Matthew Simmons by running ads arguing they aren't really making that much money. ExxonMobil's margin was 11%. Big deal. Last quarter Google's margin was 24%. I don't see anyone in Congress calling for a windfall profits tax on Google. windfall profit tax on Google? Google has protected themselves quite nicely by publicly declaring their "Don't Be Evil" motto. If Big Oil had thought to do that many decades ago, they probably could have pulled the wool over our eyes even better than they already do. But seriously. Exxon could start, as peakguy says, by investing in renewable energy, and a nice second attempt would be at cleaning up the environmental disasters that they've sometimes left behind. As for the price controls that Leanan mentions from a CNN poll, please. We really need a better information campaign explaining why this is such a crappy idea. I'm not sure any "information campaign" would work. People don't wanna hear they have to give up their SUV. They'd rather believe in Evil Arabs or Evil Big Oil or Evil Environmentalists. They actually did pass price controls in Hawaii. (Yes, even with a Republican governor.) They are not '70s price controls, and don't seem to be hurting. Not sure they're helping, either. Why are price controls such a crappy idea (aside from giving Halfin a stroke)? Many believe that the long gaslines of the '70s were caused by price controls. Rather than allowing high prices to cause demand destruction, the prices were kept artificially low, so people didn't have to change their habits. There was a lot of demand destruction in the 70's, as can be seen by the dramatic drop in oil consumption at the time. We bought a rabbit diesel that got 45 mpg and had to wait 4 months for it (like Prius now, but it only had about 49 horsepower). When oil got cheap again, most reverted to old habits. Personally, I'm not sure price controls were the cause of the lines. There may be other reasons not to impose price controls, but shortages lead to lines, regardless of price. As we saw after Hurricane Katrina. Letting the price rise may be the easiest way of creating demand destruction, but politically, it's fraught with peril. I expect there will be a lot more people demanding price controls or windfall profits taxes in the years to come. Price controls need a corresponding rationing mechanism, if there is a true shortage driving the price increase. If the rationing mechanism is poor, you'll create a secondary market for people selling their rations at a high price, have to deal with people scamming little old ladies out their rations, etc. Hawaii doesn't have rationing now, does it? Are the gas caps causing any shortages? Hawaii's price controls are very different from the ones in the '70s. They limit the wholesale price, not the retail. And it's adjusted to market price each week. Hawaii claims that they are discriminated against, because they are a small market. The price controls tie the Hawaii price to the prices in NY and LA (plus extra for transportation, taxes, etc.). The governor also has the right to suspend the price controls if necessary. Individual gas stations can still charge whatever they want. It seems self-evident that, if there is a significant shortage driving up prices, that capping the price will lead to shortages at point of sale. Either the price itself imposes a rationing mechanism (perhaps unfair, but easy to implement) or a government must decide who gets how much gas and at what price. I can't say I know the details surrounding Hawaii's price controls. Perhaps the price delta between the capped price and what would be the uncapped price are too small to be stimulating much additional demand, or perhaps Hawaii is small enough that the additional demand is supplied without creating issues elsewhere. I think the key issue though, st that there is not a widespread shortage right now. Maybe non-Hawaii folks are paying slightly more at the pump due to Hawaii's price controls! I think it's kind of ironic that on the one hand we have people calling for a tax on gasoline in order to get ready for a peak, and on the other we have people calling for price controls in order to keep the price down. Price controls encourage consumption, which is the opposite of what we need when high prices are due to shortages, as appears to be the case today. As far as an energy tax, I agree with Lou Grinzo's comment a few days ago that as we approach the peak, the market will make oil products get more expensive, hopefully in a gradual way. That sends the right message, that people need to conserve, and it does it in an economically flexible way, with prices automatically adjusting up and down as supply and demand fluctate. Assuming you control something to a low price, nobody sells you any; they'll sell it to us. Gasoline price here today is 4.60 USD/gallon. If it is controlled to a high price, you only buy what you can eat of it to keep you from starving to death. Ahem. Last I looked we weren't running out of internet bandwidth. So what's your point? If these oil companies don't invest their profits to improve supply and production or invest in renewable energy sources then I think a windfall profit tax is perfectly acceptable. If they go spend their profits on buying gold derivatives or the ilk they have failed their mandate of using the profits to bring down the cost of energy. As a matter of fact, Google is using their profits to buy up unused optical fiber. I'd say Google is behaving as it should. Exxon Mobil? Why exactly are they buying GMAC? Only joking. But I wouldn't be surprised to see them bid on it. Remember, their only obligation is to their stock holders and the stock holders don't give a damn where the profits arise. There are going to be a lot of PO'd voters when oil gets to $4 a gallon and our government won't be shy: they will lay an egg and tax the goose. A recent survey in Canada shows 60% support for nationalization of energy companies. Don't underestimate the wrath of a frustrated SUV owner. They aren't about to remember that seven sisters have been living on pauper's profits for ten years. It's all about "what have you done for me today?" A majority of respondents support either a windfall profits tax or oil price controls. So, if Google could just make 30 times their current annual profit, they could be at the level of Exxon. We all have goals. C'mon Google! Sorry, but the Google/Exxon comparison seems silly to me. Exxon is making money directly from sales to consumers, at prices that are inflicting some serious economic pain. Google gets their money from advertisers, and provides one hell of a great service to the public for free. Maybe I'm just being picky, but those seem like quite different situations, especially when the question at hand is whether to impose a windfall profits tax. And as I've said before, exactly how much of my tax dollars go to fund the military so we can maintain control over the internet? How many square miles of public land to we allow Google to destroy each year? The fact is that a significant part of the US military budget is directly associated with securing oil. If Exxon and the other oil majors had to foot the bill for this and other taxpayer funded assets and costs they would have gone bankrupt years ago. Therefore they are entitled to no profits whatsoever, certainly not until they pay off their debts to the American people. How is it that it makes sense for them to make obscene profits selling products to their creditors? Let's drop this charade - these are not really private corporations at all, it is just another way of funneling public money to the wealthy. Somebody is paying for the advertising revenues that Google is making. IE. no free lunch. everybody who buys products from Google clients pays for advertising budgets from which Google derives its profits. Bought any baby shoes lately? Why is a Coke $1.50 for 10 oz. Its only sugar, CO2, water, food coloring, transportation and Advertising. Now that's expensive stuff! What's that per gallon. How about Windfall tax for Coke? If people were truley upset about the 36 billion in profits they would make an effort to fill up at the competitor next time. How difficult is it to fill up accross the street. But they won't - so the Google/Exxon comparison is not so silly. When it comes down to it I don't have to buy from Exxon. They are providing a public service (a convience store), but I can go else where. Google provides a public service, but I have to look at the ads, granted google does it better then anybody. What would I do with 36 billion dollars? That's easy. I'd put it into the oil business. Seems like a no brainer to me. Why do you think Exxon made so much money this year? Do you think that's going to change next year? Their best investment is in oil: exploring, producing, selling. Reinvesting that money into their business operations is the very best thing they can do. But they aren't doing that. That's what people are upset about. I'm riding my electric bike to work, and I bought Exxon and Chevron call options on the dip today. I'm riding out the gold mining call options. "What goes up must come down, where she lands - nobody knows..." If you can't beat them, join them. Silly question. If I was BP, I'd pay 98.9999% out to my shareholders so they could go out and buy SUVs. Then they could buy more gasoline. I would also reserve 0.0001 % to print lots of green and yellow bumper stickers so they could feel good doin'it. The last 1%, I would pay myself, 'cause I know I'm worth it... because, you know? Next year I'm going to tell everybody to do the same thing. Re: "What would YOU do with $36 billion profit?" How about ... give most of it away to the poor??? Is that such a dumb idea? While I admire your idea of "at least giving some of the profits to the poor" I must ask where does one draw the line? I once heard a statement: "give me your credit card, and i'll bankrupt you with compassion". Basically keep throwing money at me, till i say "enough"
Ok, so they give most/all to the poor. next qtr, they look around to see who wants/needs it again. you think there will less waiting for a handout? Doubtful, there will likely be more. Thus she is even more poor today than she was before her hubby died. Sad! So where does it end? just keep giving out money every qtr? endlessly? how much does one continue giving? this is a touchy subject and many people are full of opinions, and while i do not wish to engage in a battle of right and wrong, i thinks it's ok for a company to make money. Remember the looting in New Orleans after hurricane Katrina? as shown on CNN, Fox, Msnbc etc? recall seeing someone taking a television set? do you think that person was going home to hook up to cable? so he could watch Fox sports report on Baseball? or watch CNN on how the rescue attempts were going around New Orleans, maybe even in his own neighborhood? While i dont have a problem with him looting essentials to life or death, (food/water/basics) or even a case or 2 of beer or 5th of scotch. I disagree with non essentials like dvd players, TV's etc. it's not like electricty was of abundancy there for while. Priorities man, no priorities! In reality, it was most likely to be pawned for more drugs. that was likely his priority. so where do you draw the line on handouts from the big evil oil companies? should they be restricted to a 1% profit (or less) while other companies are unrestricted? Seriously? I would start a company manufacturing electric sports cars. Thanks for posting that. I hadn't heard of it, or of the Burj-al-Arab hotel. Man oh man, the absolute extravangant wastage of the world elites. I just cannot believe the opulence...unreal. Make um higher. They forgot about global warming raising the Gulf level a foot or two. There's gonna' be a lot of foundation raising going on there some day. Or visit Hydropolis, the underwater hotel. Dubai's quite a place, that's for sure. Thanks for the real estate recommendation. Solves the global warming sealevel rise problem. Bush State of the Union: getting religion on energy? Here's one potential big deal in the president's State of the Union speech: A Nixon-goes-to-China on energy issues. A senior White House aide I spoke to over the weekend says the president will focus on new energy technologies, which means alternatives to oil production. The aide cited a Fortune article touting energy alternatives. He also noted how Richard Rainwater, once Bush's Texas Rangers' partner, now champions the peak-oil theory. That's the line of thought that says the world's hit its top production capacity for oil. From here on out, oil's downhill. I haven't had time to run down Rainwater's beliefs, but, if this is true, that's a huge shift. Rainwater had bet heavily on oil when it was selling at low prices. He looked crazy, but he was considering how demand was growing in China and the Far East. It turns out he was right, which makes his voice on peak oil particularly significant. It will be even more big-time if Bush starts getting religion on energy alternatives. A Texas oilman who gets behind them could outdo a red-baiter like Nixon going to Peking. It even uses the same "Nixon goes to China" comparison. Was DMN on the acronymn list? What does it mean? I hadn't realized that Rainwater was one of Bush's partners when he owned the Rangers. That sure is interesting. Matthew Simmons says that Bush didn't seem to understand peak oil. Just looked at him with "curious incomprehension" when he tried to explain it. I wonder if Rainwater got through where Simmons couldn't. The back story here is that Jim Kunstler may have influenced the State of the Union Speech. Rainwater became concerned about Peak Oil after reading JK's book. Bush respects Rainwater. We will see what Bush says. FYI--The Oil Drum is one of Rainwater's top five favorite websites. Let's see. Hummm. How many Chinese solar panels can we buy? This link takes you to a plot of Russian production showing the predicted production curve, based on Hubbert Linearization (HL) versus the actual data. Note that only the data points circled (through 1985) were used to construct the model. The data plot was put together by Khebab, who may not share my views on Russia. The HL method--using only data through 1985--predicted that Russia would produce 61 billion barrels (Gb) in the 19 years after 1985. In reality, Russia produced 57 Gb. Actual production was 93% of predicted. I think that it is significant that actual production is 4 Gb below the HL prediction, given that everyone is so mesmerized by the recent increase in production. Currently, it appears that production is about 5 million barrels per day (mbpd) above where it should be based on the HL plot, but 5 mbpd is 1.8 Gb per year, so we could actually see a year or two of rising production before production reverts to the curve (assuming that it will). For what it's worth, my bet is that Russia will start a steep decline no later than next year. If Russia is going to revert to the curve, if it started right now it would probably require a decline rate of about 11% per year. Note that production growth year over year is slowing, from 11% to 9% to 2.7% last year. Note that if Russia had followed the curve, and if current production was LOWER at about 4.5 mbpd (instead of about 9.5 mbpd today), total cumulative production would have been 4 Gb HIGHER than current cumulative production. I suggest that you read that again. Russian production has just been rebounding from the post-Soviet collapse in production and as cumulative production gets closer to where it should be, year over year growth is slowing, which is what happens before production starts falling. I guess my basic question is if the HL method was 93% accurate in predicting the incremental cumulative production from 1985 to 2004, why are we so distrustful of the predicted production in the next couple of decades? The model predicts that production in 20 years will be down to about one mbpd. I concede the point that lightly explored basins in Russia will add new production, but I suspect that it will be as Alaska was to the US--it helped, but it did not reverse the long term decline. Also, it takes a long time to add significant new production facilities. IMO, the math is clear. The only long term trend for the vast majority of existing Russian production is down--and down sharply. This plot reinforces my concern that we are facing an immediate crisis in net export capacity. What if the Saudi plot is 93% correct? Looks good to me. Whether the Saudis and the Russians follow the curve should be obvious real quick. However, nobody's going to like this analysis because if it's even close we are probably doomed. Did that curve predict the fall of communism? Don't you think the utter chaos and total economic collapse which Russia experienced in the 90s might have had a lot to do with the precipitous drop in their oil production? The fact that even with this total calamity, Russia still hit 93% of the value on your curve suggests to me that your curve is bogus. The Russian decline was sharper than it should have been, because of the chaos surrounding the Soviet collapse. 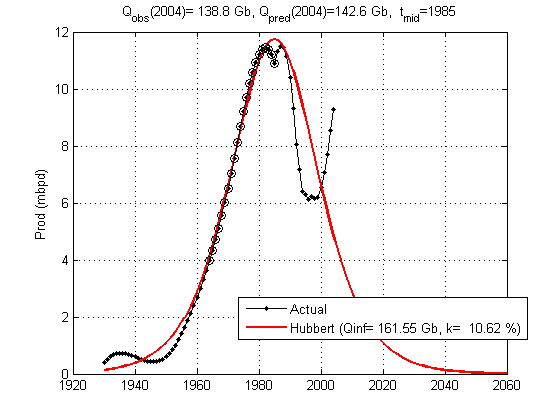 The Hubbert Linearization (HL) method accurately predicted the Texas decline, the US decline and the North Sea decline. "Conventional Wisdom" has consistently been wrong, while the simple HL analysis has consistently been right. My vote is with HL. Why is westexas' conclusion bogus? You act as though the few year period that marked the fall of communism would have a significant statistical impact on a decades long production curve. It didn't. It was abrupt but short lived. That 7% number even "feels" about right when you realize what the total production was. I suggest that you find the specific flaws with the conclusion. Explain why those are flawed. But frankly, the missing surface between the Hubbert curve and actual values even looks like 5%-10% of the total surface under the curve. Thus, I fail to see why decades of oil production by Russia should show a significant long-term statistical perturbation based on a few years of disrupted production, especially when the production that did occur was still more than 50% of the prior maximum volume for the (relatively) short period of the disruption. I suspect, Halfin, that you simply dislike the conclusion, on purely emotional grounds. Unfortunately, emotion is not sufficient basis to render a conclusion invalid. Present your reasons for your opposition to westexas conclusions, please. If you have a real argument, then it should be heard. It's hard for me to believe that with the fall of communism and the need to totally reorganize the structure of the Russian economy, which we know caused enormous hardship, suffering, and economic dislocation on the part of the Russian people, all this would only impact oil production by 7%. Not only that, as I pointed out in the earlier thread, the HL chart doesn't even look reasonable; Russian production has been steadily trending higher and higher above the predicted curve. On other HL charts, when this happens, people draw a new line through the latest trend. But if you did that in this case you'd get an infinite supply of oil, which is unreasonable. Russia's situation is so unique that conventional HL analysis doesn't work. Khebab agrees with this and he has studied it as closely as anyone. His modified HL model gives remaining recoverable reserves as about 80 Gb, consistent with expert testimony quoted by Dave (one of the strongest Peak Oil supporters here) about Russian fields, while Westexas has it as 18 Gb! I am not questioning these conclusions on emotional grounds, but rather because Russia looks to me to be a clear case where conventional HL analysis is not going to work. Production was bound to increase, after the very steep decline after the Soviet Collapse, but Russian production is 4 Gb below where it should be (through 2004). As production gets closer to making up the difference, you would expect the rate of growth to slow--which is precisely what we have seen. It has gone from 11% to 9% to 2.7% last year. I predict that production will stabilize and then start a permanent decline. Ignore the Hubbert curve for a moment, Halfin. Your fixation on his 7% comment seems (to me) to display a bit of tunnel vision. This is a 7% perturbation in total production since production began decades before. Now, for the actual years in question during the collapse, production in any one year was down as much as 50% but since the period of the collapse was so short, the impact on the total production (Qt) was minimal. Think of it this way - what's your average income if you make $200,000 a year for 15 years then are bankrupt and make nothing for 1 year, then make $150,000 a year for 5 more years? It's $178,000+ per year and yet for 5% of that time period there was NO income at all. Now look at the Hubbert curve that westexas references - the new "increased" production almost exactly matches the "lost" production from the period of economic instability. And again, unlike England, where we had a verifiable additional oil find (the North Sea), we had none in Russia comparable. Instead, all we had was a temporary interruption via a political/economic event and then a resumption of what the existing geology allows. There's no basis for doing a "dual" humped Hubbert curve here that I can see since in the past that was done to accomodate new finds (such as the impact of the North Sea on English production) that were so large they needed to be refactored in with prior data. Here, lacking a new find that warrants the increase and instead just having political/economic stability return, we are continuing the existing Hubbert curve. Second, your prior comment in the earlier thread simply assumed that you can extrapolate from the limited data that you wanted to use. That's not valid either, is it? Using the entire trend line, as westexas has done, seems reasonable to me. The US production has not exactly followed the HL but it's been damned close. The fact that Russian is a less ideal fit yet still linearizes as it does should give us great pause before extrapolating out to 80GB, no matter what some optimist says. Look at how often these same optimists have been wrong in the past from ignoring the HL trendline! Third, neither you nor Khebab have explained why the second Russian peak is "immature" and should be treated as a double logistic curve at all. As I said above, every other time that is done it is done in response to new discoveries. Here there are none, just a political/economic event that simply delayed existing production. Can someone explain to me why the double logistic should be used when there was no new discovery to warrant this? Would you use a double logistic if the US pumped oil as before til 1972, then turned off all the spigots for 20 years then resumed in 1993 exactly as it had in 1973 in the real world? In my hypothetical case, it the cessation of oil flow is simply a temporal disruption, not a change in original supply. Thanks in advance for an explanation of this. The HL method--using only data through 1985--predicted that Russia would produce 61 billion barrels (Gb) in the 19 years after 1985. In reality, Russia produced 57 Gb. Actual production was 93% of predicted. This is a 7% reduction in post-1985 production, which is the date (roughly) of the Russian peak in production. In other words, since the fall of communism shortly after 1985, Hubbert predicts 61 Gb and the actual is 57 Gb, only 7% less. Thus my conclusion that even with the chaotic and indeed catastrophic repurcussions from the fall of communism, Russia still managed to get within 7% of what Westexas predicts with his Hubbert linearization. This is what I described as implausible. Thank you for that correction. I am still interested in why a double curve applies here when no additional source has been added to the inputs - just a temporal disruption on outputs. A skilled geologist can look at preliminary surveys of an unexplored province and place an upper limit on the size of a reservior that MUGHT be there. A statistican looking at oil fields thousands of km away cannot place an upper limit of unexplored provinces. You are a statistical analyst. You are WAY off the mark saying that "you do not expect" what may or may not be in unexplored basins. Your expectations have no relation to facts about an unknown. Your analogy to Texas is DEEPLY flawed. EVERY onshore basin in Texas had at least one well drilled (some of which missed the large, but not supergiant, fields in that basin) by the 1930s. There were no political or technical (except depth) limits on exploration in onshore Texas. Supergaint fields are hard to miss with even the first well in the basin and primitive geology. Later Texas drilling found the large, medium & small size fields missed with primitive geology and shallow wells. Mexico (part of Texas offshore geologically, but not politically due to a 19th century revolution) did not find Cantarell till the 1970s. If the United States had drawn maps differently in 1848, Cantarell would have been found in the late 1950s or early 1960s. If one does not explore, one does not find. There is a chance that a second Ghawar may be off the delta of one of the Russian rivers. There WAS a chance that Prudhoe Bay could have been 3 times larger than it turned out to be. You assume that because Prudhoe Bay was so large (an accident of geology) then any unexplored Russians basins will be no larger has no predictive value. (Note that many oil fields are along the ancient deltas of major rivers). I will listen with great respect & interest to a Russian geologist who talks about the structures offshore from the Ob or the Barents Sea. And I will accept that, with modern geology, any potential Ghawar will be found within the first 5 wells drilled in a basin (and probably with the very first well). But absent any wells drilled and absent detailed geological survey knowledge, your predictions of the size of of oil discoveries in unexplored basins has no basis. I am willing to accept that, based upon statistical analysis of the 80+% of the world's basins that HAVE been explored, that the remaining ~10% unexplored basins are 1) unlikely to have a field larger than Ghawar 2) that the pattern of unexplored oil reserves will follow the pattern of the explored 80+% basins. They is X% chance (less than 10%, proably less than 2%) that offshore Russia is another Persian Gulf. However, you cannot seriously preclude another aupergiant field in a completely unexplored basin in Russia (or Norway). If you want to state (which I believe) that EVEN IF another Ghawar is found in remotest artic Russia it will not save our bacon, then do so. And it is valid to argue that whilst a second Ghawar could be found in the remaining ~10% of basins, (after all only one was found in the first 80+%) it is HIGHLY unlikely that TWO Ghawars will be found in the remaining 10%. Just do not impose an artifical limit on what is there when no one knows ! Texas peaked at 54% of Qt, and it has fallen ever since. The Lower 48 peaked at 48% of Qt, and it has fallen ever since. (You can add in Alaska, but it doesn't change the long term decline). The North Sea peaked at 52% of Qt, and it has fallen ever since. In all three of the above cases, the Conventional Wisdom (CW) was dead wrong, and the simple Hubbert Linearization (HL) method was dead on right. Most notably, the majors working the North Sea--with the best talent and the best technology in the world--were 100% dead wrong about the North Sea peak. The simple HL statistical model was dead on right. Russia peaked in a broad plateau around the 50% of Qt mark, and HL has accurately predicted 93% of the post-1985 production. Can anyone name any other technique that has been this accurate in predicting long term production over close to two decades? I concede the point the unexplored and/or lightly explored Russian basins will add production, but I predict that it will basically have the same effect as Alaska had on total US production. It will help, but it probably won't change the long term trend. The key Russian oil fields are so far down the depletion curve that huge production declines are a mathematical certainty. Worldwide, lots of things are possible, but the fact is that no one has found a one mbpd of larger field since Cantarell, 30 years ago (again, it seems that the Caspian Sea production was primarily a question of deciding to develop it). Russia should soon start seeing production declines of several hundred thousand bpd to one mbpd per year. So who are going to believe, the CW guys who have gotten is consistently wrong, or the simple statistical HL analysis that has gotten it consistently right? When Russian output starts to decline again, then FSU production is pretty much in decline. Since we know nonOpec &nonFSU production is past peak, it appears we're in trouble, knowing that SA can't be relied upon to save the day. I'm no geologist, but at least an engineer who can easily see your point about disliking any attempted quantification of an unknown quantity, but like it or not, I and many thousands of people every day use millions of obvious limits to the probably of events to define our course of action. And, until all the basins in the world are totally explored, nobody can argue with the probabilistic results. In the meantime, it serves to quantify, qualify and determine the direction towards viable options and set appropriate strategies and responses to the most probable scenarios, while not wasting much limited time and resources on the least probable, even if they are supposedly more accurate. Professor Deffeyes, a geologist who worked in the petroleum industry before moving to academia, says that most of the basins of the world have been explored and drilled. That's one key point - most of the looking has already been done. That's why exploration results yield less and less and less successful wells since the early 1960s. Well, then (all probability aside) that just sounds like praying for a lucky strike. I'll stick with the probability function for a very limited sample size. Now, I am not a geologist or any other kind of oil expert. Like Stuart I am a software engineer. So the following may be complete crap. Initially, my reaction to westexas Russian prediction was similar to Dave's. That is, I found it hard to believe, looking at Russian production recently that they could somehow drop. Now if you extrapolate the last segment of this graph (2004-2005) over the next two years you get a 5% decrease in production this year and a 12% decrease in 2007. Now that seems like a pretty drastic, but plausible, turnaround in Russian Oil Production. In his book, Simmons talks about technology and field production. Giving many examples, he shows that when tertiary pressure recovery systems such as at Brent, Cantarell, Ekofisk, etc begin, you can get a very dramatc increase in production, but that this will peak in maybe 3 - 5 years, 8-9 at most, then be followed by rapid decline. I understand, but can't prove, that the real Russion boost in production came from working over old fields with new technology, starting around 1999 or 2000 and continuing on. From this, you would predict rapid increases over the next few years, just as we have seen, but on schedule, around now, the efforts would show signs of running down, with declines right about now. The pattern as observed is exactly what you would predict from this scenario. Now it remains to be seen if the predicted decline would occur, or if new fields make up for the loss. That was pretty much my conclusion. I think that, at a minimum, we are going to start seeing double digit declines very soon--probably next year. What has frankly amazed me is the level of denial on the subject of Russian oil production--on a Peak Oil website of all places. I'm certainly not comparing myself to a genius like Hubbert, but I got a small taste of what it must have been like for him to challenge the conventional wisdom. I think that we are facing a clear and immediate danger, because of a lack of net export capacity. BTW, if you missed it the Russian oil companies have announced that they are cutting back oil exports because of heavy domestic demand this winter. Yes, and hasn't some production been shut-in because of the cold weather? If they had a high water cut then that would most definitely be affected by very low temperatures. That shut-in, if it lasts a reasonable length of time, will almost certainly cause their production to drop this year, unless, as Peakearl says, they make some new finds. Although, anything found this year isn't going to be in production for a few years yet. I want to jump to Westexas' defence. I read Matt Simmons book last year and one of the things he mentions is the Soviet Union and its oil collapse. Between pages 304 and 307 he mentions parallels between Soviet and Saudi oil production. Post Soviet collapse, Russian oil production has dramatically increased by using modern Western technology (super straws etc). Matt Simmons states that "The moral of this latest chapter in the Russian oil story is that oil left behind can be produced, and through the use of high technology well completions, quite high flow rate can be achieved. It is simply not sustainable, however. The corollary of this principle is that all oilfields have their rate sensitivities. Ignoring the concept and overproducing jeopardises future production for any field, even in such prolific oil provinces as Western Siberia and Saudi Arabia." Soon after reading his book I sent an e-mail to a friend, stating that I thought Russian and Saudi oil production totals could be as little as 3 million barrels a day each by 2015. This is a WAG, but after seeing Westexas' graphs I can see this coming true. I am always suspicious of academics saying the future will be this (especially after reading USGS reports), but I feel on more confident ground when someone says prove me wrong, here is my work, have a look at it. I respect that, as it shows honesty and the person hopes that they haven't made a howler somewhere along the way. The easiest way to prove Westexas right or wrong is to see Russian oil production figures at the end of next year. He has made a very big prediction and let us see what happens. If he is right, we should applaud him to the rafters, if not, perhaps the mathematics doesn't work too well in real life. I, for one, believe him although the timing might not be spot on. I think Russia has more oil that Westexas predicts it has, but the difference may not matter in altering the shape of the slope and that is the crucial, downward point. I was looking at oil futures market prices yesterday to get a feeling for what the market foresees for 2006. This shows what the market expects in terms of price appreciation, and also in terms of how much volatility or variance the market expects to see. Markets see a 25% chance the price will be below $59, 25% for $59 - $70, 25% for $70 - $80, and 25% for above $80. I also tried to estimate what the chances are for a price above $90, and it is a little hard to judge due to thin trading, but it looked like around 12% or 13%. I.e. you can get about 7 to 1 or 8 to 1 odds if you want to bet (via buying a call option) that the market is going over 90 this year. Halfin I think you owe it to yourself to look at what the numbers were 1, 2, 3 months back. You will be better to watch my nods, lol. You can bet on oil going over $90 this year with a 95% probability (seriously). Ignore the futures markets' pricing, they have been seriously incorrect these last 3 years. Actually both predictions could be right. Prices could "go" up over $90, then "be" at $70 in December 2006. 'However, he says it is also part of a compromise. The Americans and the Europeans had been pressing for formal referral - a move that would normally lead to sanctions - but settled for the less formal option of "reporting" Iran's activities. Iran is expected to face more criticism at the special IAEA board meeting in Vienna on Thursday. But analysts say the powers will wait until the regular board meeting in March to put their planned resolution into effect. going to stop trading because the US demand it? could break loose any time after March. And the Iranian Oil Bourse is set to start business when??? Hmmm, I believe it is March. Coincidence that all these events seem to pinpoint that month? These are exciting times we live in. Some day, it will all make a terrific book/movie. Isn't it the FBI that says there is no such thing as coincidence? Isn't it obvious? Sanctions would put up a roadblock that would heavily discourage anyone, but (perhaps) China, to participate in oil sales in Iran. I don't believe Iran will like hearing "sanctions" and will revert to drastic measures where the good of the population in general will not deture their political purpose. I also have no doubt that a significant majority of the population will see it as their patriotic, if not religious, duty to participate in enduring the hardships imposed on them by God in making all attempts to resist the infidels. Nothing new there. This article goes into more detail. Includes a rebuttal by Pimentel. Peakguy asked us a question up near the front of the thread. I found this URL over at Kunstlers CFN from yesterdays posts. I think it answers the question perfectly. sure hope it comes up as a hot link, but from here it may not. I am not a fan or hard currency, But sometimes I wonder about inflation and the price of oil. Could our current price be simply a symptom of inflation and not a woe of production? I think it's possible. There is an interesting article in 321Energy.com that addresses price of oil to amount of US dollars in circulation. "Since the younger Bush took office, the U.S. has been frantically printing money to stave off recession and keep the bloated American economy from collapsing. Fiat dollars have made their way around the world and now constitute the major foreign currency holdings of most countries. Central banks in China and Japan hold an estimated combined total of $1.3 trillion. With the modern equivalent of printing presses going flat-out, the world supply of money has almost doubled since 2000, from less than $2.5 trillion to just below $4.5 trillion. Interestingly, as money supplies have increased, so too have oil prices. While there are certainly other factors at work, it is hard to ignore the correlation between the doubling of the money supply and the rise in crude." ..or the increase in price of just about everything not found on a Walmart shelf. "The other implication is that real supply-and-demand problems may not yet be fully priced into the oil market, even with crude at $65. In fact, the ratio of the oil price to world money supply currently sits near its historical average (represented by the green line). That is, crude is not overly expensive, given the amount of money in the world." This could mean that we aren't even at the point where real production problems are evident and the cost is still $60 plus. Inflation seems to be the growth hormone jacking the price higher. And we haven't even experienced significant, world altering production problems yet. I think you have something there. Just track the price of oil in Dollars, then convert that price to Euros, Gold and Yen over the last five years. Those are pretty much linear. The Dollar track is not. When there is a break between oil and the other's, ie. when they decreases in value in relation to the dollar, it looks to me like the oil price starts going down to meet their new value price. Yes, that is relevant. The key aspect is the tie between oil and $, when it breaks the economic SHTF, especially for $ and US. When the $ / oil tie breaks the economic reality breaks too. The timing of thee things will be significant. "The [American] empire has entered the phase of desperation, like a vampire who sees dawn approaching and realizes that he still has not sucked enough blood. The United States invaded Iraq for oil; it doesn't care about democracy or life. They are desperate because their reserves of gas and oil are running out." How can you not love this guy? Viva Chavez! Thank You, I much appreciate your support. To all my fans in America, make sure you watch the George Bush tonight, and please...buy the Citgo gasoline. And Hugo...any thoughts on the Iranian Oil Bourse? Do you plan on selling your oil there in March? Hugo's planning a Venezuelan Oil Bourse. Ah, sadly perhaps or not, I am in UK, but I do not buy Esso / Exxon, lol. Been listening, he's been speaking well (though a mite false) perhaps he's been tutored? I read that he spent all weekend with his handlers rehearsing. Can't get any Citgo here. I would love to buy it at twice the price. Hate BP. Wouldn't tank up there even if it were free. Aside: See! All actions do not appear rational to others, but I have my reasons. So, don't count on Iran being rational from your perspective. Sr. Presidente, Is the PetroZuata pipeline cooking the dirt around the pipeline? I told them it might do that. Sorry, it wasn't my call. Hard to believe, nobody has brought up that this is the beloved and esteemed Alan Greenspan's last day on the job. I was planning to but my tax return took priority, sorry. I am equally surprised that none have commented, this is the end of a long and significant reign; it is immensely more significant than the probably vacuous state of the union party. Greenspan, the man who spun the Reagan illusion beyond Reagan's time. I agree with his nick "Maestro" for that is what he has been, conjuring an implausibly stable reality from a sea of quicksand. He has been consummate in that role. The mere change of Fed head is a moment of risk, the last two have been tested by events. This time the risks are greater. Greenspan has been in charge a long time: it has spanned 6 presidential terms. In terms of continuing the illusion it has been more important than any of them. Helicopter Ben is a very smart man. But he is an economist and that is a handicap that many of us here would recognise. 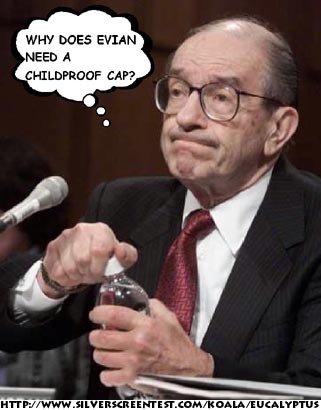 Greenspan had a knack of utterance that bemused markets into believing what was best for them. Will the illusion persist? Probably not. What happens, then? I don't know, but I don't think you will like it. ...the most extraordinarily successful economy in history. Maybe if you look at it from start to finish it is. What Bush won't be talking about this P.M.
Looks like Lovelock's prognosis for Gaia has prompted other scientists to come out of the closet and say what they have been previously reluctant to say. I would expect that 2006 will be the year of "awakening" re. the terminality of the environment and resources. THE report Avoiding Dangerous Climate Change brings out very clearly just how fast scientific worries about climate change have accelerated, propelled by a new fear -- the "tipping point" when change becomes irreversible. We have already reached one such point in that we cannot go back to a system with no climate change. We know that carbon dioxide continues to act climatically for about 100 years, so if we went back to the Stone Age tomorrow we would still experience another century of warming. But there are further tipping points where subsystems break down; for example, the Gulf Stream slowing because less cold water is sinking at high latitudes. Eventually a point is reached where the whole climate-regulating system breaks down, producing changes that can never be reversed. Just recently, for instance, it was realised that as carbon dioxide levels rise the oceans become more acidic and that this will destroy plankton, especially plankton with shells, which absorb and reduce carbon levels. The Intergovernmental Panel on Climate Change (IPCC) concluded in 2001 that the rate of global warming is about one third faster than previously suspected. It predicted that by the end of this century there will be an average warming of between 2C (3.6F) and 5C, with devastating consequences. The next IPCC assessment is due, and the new fear is that runaway change could soon be upon us, whatever we do. Funny how quickly events in the past month have transpired against the 'what me worry?' economic punditry don't you think? Heck, a couple of weeks ago, CNBC and similar MSM channels couldn't find an 'expert' who wouldn't parrot the Fed line of a signalled pause concerning interest rates increases. Three guys - a Canadian farmer, Osama bin Laden, and an American engineer are together one day. They come across a lantern and a genie pops out of it. "I will give each of you one wish, which is three wishes total" says the genie. The Canadian says, "I am a farmer, my dad was a farmer, his father was a farmer and my son will also farm. I wish that all the farmlands of Canada will be forever fertile." Pooooof! In the blink of the genie's eye, the land in Canada was forever made fertile for farming. Osama bin Ladin was amazed, so he said, "I wish for a wall around Afghanistan, Iraq and Iran so that no infidels, Jews or Americans can come into our precious state." Pooooof! Again, in the blink of the genie's eye, there was a huge wall around those countries. The American engineer was curious so said "May I first ask a question? Please tell me more about this wall". The genie explains, "Well, it's about 5000 feet high, 500 feet thick and completely surrounds all three countries. Nothing can get in or out. It's virtually impenetrable." The American engineer responded, "My wish then is that you fill it with water up to about 4000 feet." The isostatic earthquakes take out Iran and Pakistan, too. A trifecta. Wonder what the thermal inertia will do to the weather in Pakistan and India? No more cold winters, so they get three crops a year? In a poll conducted for the University of Maryland's Program on International Policy Attitudes between June and August last year, fully 74% of Chinese citizens said they agreed with the statement "the free enterprise system and free market economy is the best system on which to base the future of the world." The Philippines, at 73%, and the U.S., at 71%, were second and third. The poll, which surveyed 20,791 people in 20 countries, seems like a pretty good snapshot of current sentiment, as such things go. Experience does count then. They're new at it. Barron's fro January 30 had a roundtable discussion. One throw away paragraph on page 34 noted that the Gulf hurricaines had destroyed 19% (estimated) of the insurance industry's regulatory capital, and that 9/11 had only destroyed 7%. Samberg figured maritime insurance rates had gone up 400%. And they continue to spend more on the boogy man than the leeves. The big question I always have is "when"? As I read the posts at TOD, and I contemplate slow squeezes and projected maximum productions, I keep thinking that any system that is pushed close to its capacity will begin to experience losses. As you drive along a freeway that is starting to get too crowded, you may be able to see that if everyone maintained lane discipline and worked in a unified manner, that the speeds and throughput could be much higher. But it won't happen - someone wants go 20mph faster, someone is on the phone, another has a malfunctioning vehicle, etc. Perhaps it's just entropy. But I expect that these losses will manifest in trying to achieve and maintain maximum oil production too. Politics, wars, hurricanes, what have you will prevent us from getting to what might be done if everything went like clockwork. My suspicion is that this is not accounted for - but then I don't really know how it could be quantified, and even if it could it would be tough to incorporate 9other than by fudge factor). The effect would be to exacerbate the problems we face, and make the answer to "when" be "sooner". Anyone else have any thought on this? Me too, sooner. I think Kunstler has this right; it is the mindset not real oil,unworkable oil problems that will, at least in the U. S. cause the trouble to magnify. To use another highway analogy at a red light i OFTEN IMAGINE EVERYONE hitting the gas and starting at the same time. Only seen stunt drivers do such. We are extremely individualistic and as problems intensify this will add to disorder(though might keep us from following a kooky leader). I expect an economic crash, might lead; but I often think politics will be just as likely to take front stage. It could sure coverup the lack of foresightedness; not just consciously creating a coverup, but maybe just denial. As a psychotherapist I think maybe my belief of sooner; i.e. anytime, is as I have read from Matt Savinar - most likely my personal predisposition see it this way. I know this is very very big water - I used to run whitewater- and it brings out so much personal that the facts get cloudy. I went to NYC years ago and was amazed at how the cabs didn't wreck as there were no lanes and jocking for position at lights. I do not expect it to work that well, as I said the mindset is my concern.Tell someone they are going to lose their way of life and I don't want to be on the road with them anytime soon.